The world's most exciting destination is also constantly evolving, making every visit to Las Vegas like seeing a new city! Book your next trip to Las Vegas and check out new restaurants, shops, spas, nightlife hot spots and more! Downtown Las Vegas may look a little different than you remember it. The area's revitalization has brought with it many new opportunities, from accommodations at the 629-room lavish Downtown Grand to the just-opened Downtown Container Park, a retail and dining destination in the Fremont East Entertainment District. Have the Las Vegas experience you've never had before - see what's new in the Entertainment Capital of the World! 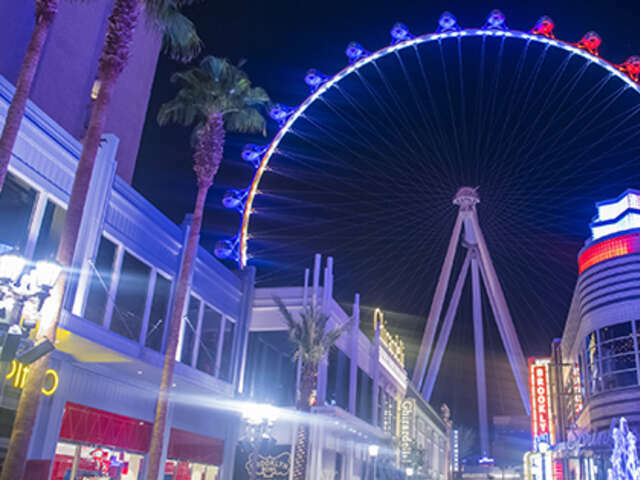 Reshaping the Las Vegas skyline with its open-air combination of shopping, dining and entertainment, The LINQ truly stands out as the home of the High Roller. This 550-foot tall observation wheel makes a statement as the highest in the world. It is also home to the reinvented O'Shea's Casino, and old-time staple turned must-hit bar and casino within the Quad Resort. After a night in Las Vegas, you might want a little retail therapy. Check out the new stores inside Crystals at CityCenter. Then, give yourself a gift at Re:Lax, the new spa at Aliante. The Las Vegas Strip welcomes back legendary musical Mamma Mia! to the New Tropicana Las Vegas. This infectious, sing-along world-wide smash hit will have Vegas audiences on their feet and dancing in the aisles with its combination of light-hearted romance and the music of ABBA. Before seeing an award-winning show, enjoy a cocktail at Fizz Champagne Lounge inside Caesars Palace. Then, fuel up at any of several new dining experiences, such as Buddy V's Ristorante at The Venetian, Tom Colicchio's Heritage Steak at The Mirage or Crush at MGM Grand. Vegas Nocturne, the new variety show within the enticing entertainment and dining club Rose.Rabbit.Lie at The Cosmopolitan, reinvents cabaret, circus and vaudeville acts, all with a 21st-century twist. One moment cheeky and the next quite captivating, it all takes place in a fantastic main room that combines VIP bottle service with an amphitheater-style viewing experience. Hot new restaurant Jayde Fuzion at M Resort is the result of the Food Network's Restaurant Express TV show last season. Chef Seonkyoung Longest won the competition and the restaurant is the promised grand prize for her efforts. In her new space, Longest brings her talent for blending the distinct flavours of Asian cuisines in an ultra-modern, stylish setting.